The fire grew to the north and east yesterday for a total size of 50,237 acres. Containment is 29 percent. Resources are rotating out as they reach the end of their assignment and are being replaced. There are currently 1,482 people on the fire. This includes 42 crews, 10 helicopters, 51 engines, 8 dozers, 18 watertenders, and 6 masticators. Fire management continues to concentrate resources near Lowman in the Rock Creek drainage, on the north end of the fire. Taking advantage of the favorable weather, additional personnel, equipment, and air resources will conduct a synchronized operation on the east and west side of Rock Creek, burning from a constructed dozer line. 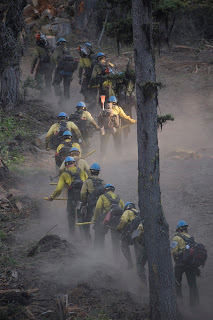 Both sides will continue at the same rate, weather permitting or until both reach the Rock Creek prescribed burn. The burn was completed April 2016. 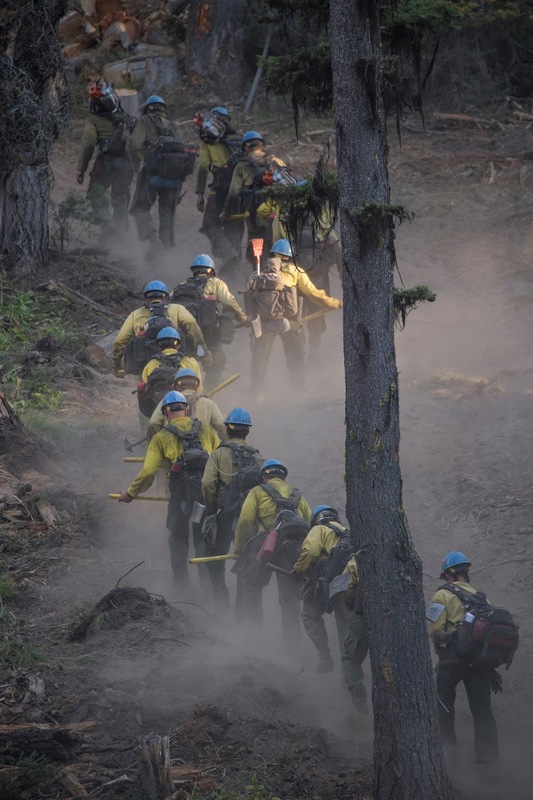 Fire managers cite steep terrain and unpredictable winds within the drainage as the biggest challenge for firefighters today. Gridding, mop-up, and patrols will continue on the southern flank. On the eastern flank, crews will continue to use previous fire scars and natural features to check fire growth. Today, weather forecasts predict slightly warmer temperatures and lower humidity with light winds from the south at 5-7 mph. A low pressure system is expected to arrive Friday, bringing the chance of thunderstorms and dry lightning towards the weekend. IF YOU FLY, WE CAN’T. PLEASE DO NOT FLY DRONES IN OR NEAR THE FIRE AREA.